I am stuck in the house. Oh I could go out and brave the sub-zero weather, but I don’t like it anymore. It would mean putting on boots, cowl, scarf, hat, and mittens, JUST to open the door. I am busy getting ready to be on the road all of the month of March. I like working so this is a good thing. But I have lists everywhere and stuff covering ever surface in my space. But the winter dull drums are prancing around my studio. They are distracting me. I did manage to make a little quilt yesterday. I had to stop the piling of kits, to be creative. I am also listening to a bunch of books on tape, I went through the whole Divergent series in a week. Any little thing will grab my attention. Too much time spent alone in the studio with the dog. He is getting lots of kisses. The highlight of my day is going for a walk at noon so the dog can do his business, but only if it is above 10 degrees. Otherwise we sit at the back door watching the birds come to the feeder. I think you can see that the dull drums are hanging out in my studio and perhaps making me go a little crazy. Cabin Fever? Please, Please, Please, cold weather go away!!! We are echoing you here in south east Texas. Cold, wind, freezing rain and sleet have kept us inside most of the last three months too. When we do go out we bundle up in warm coats, scarves, hats and gloves. Those aren’t our usual winter garb. I am very thankful for heated car seats. (Didn’t have those back home in Indianapolis.). Frieda I’m making a shop sample from one of Laura’s Fanciful Stitches house quilts. I’ll be teaching a fused applique class here next month. Oh Frieda, I understand completely! We are spending the winter in Columbus OH, and are experiencing record breaking cold. I’m working on a bunch of small quilts just building my skills and enjoying the process. Thanks for the inspiration on this COLD day and every day really! 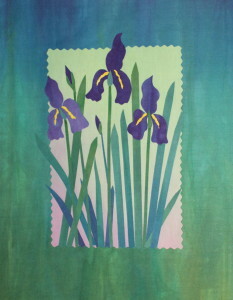 Love the Iris quilt. Can you make a kit. My mother-in-law grew iris of every color. People would stop by her house to look at them. She was a quilter all her life. She passed away Feb 19, 2012. 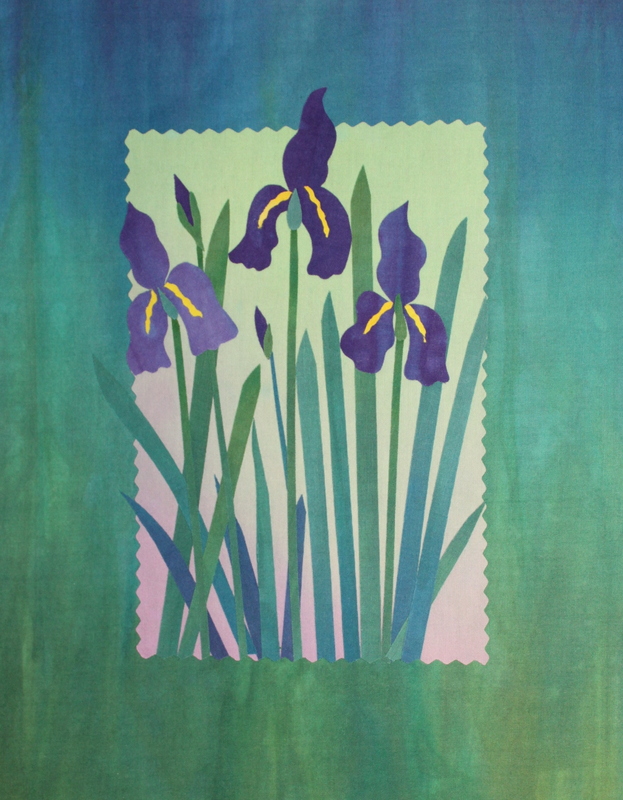 I would love to make the iris quilt in memory of her.